Two Northern Ireland sites have been shortlisted to become construction hubs for the Heathrow Airport expansion. Four UK sites will become offsite construction centres to help deliver a third runway to the London airport. The former Michelin site in Ballymena and former Shackleton Army barracks in Ballykelly have made the shortlist of 18. 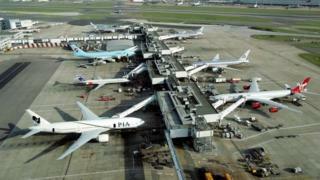 The sites will assemble components for the Heathrow project which will then be transported there when needed. There were initially 121 applications for the hubs, which were reduced to 65 sites. These sites were visited by Heathrow officials last year before the list was further reduced to 18. The £14bn runway could be completed by 2026. Emma Gilthorpe, Heathrow's executive director for expansion said: "Heathrow is as committed as ever to creating a plan that delivers for every corner of the UK. Logistics hubs are key to achieving that. The former Michelin tyre factory in Ballymena - which had operated for 50 years - was turned into a business park after it closed in June of last year. The MJM Group bought the former Shackleton Barracks military base in Ballykelly, County Londonderry, in 2016. DUP Leader Arlene Foster said: "I'm glad to see very strong Northern Ireland contenders in the shortlist for the Heathrow Logistics Hub. "If implemented this project will bring huge benefits to industry and business here." A business summit is also set to take place in Belfast in September to connect Northern Irish businesses to opportunities in Heathrow's supply chain.